Go, Go Jonah! : Kathie Hill Music, LLC, Making music with and for kids for over 25 years! 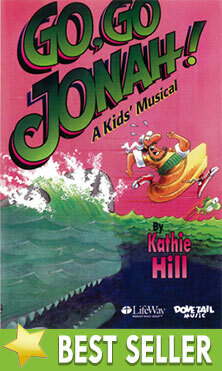 Home :: All Kid's Musicals A-Z :: Go, Go Jonah! Based on the Book of Jonah, this delightful, best-selling, missions-minded musical is ideal for end-of-the-year or summer performances. Through the experiences of Jonah, children in grades 1-6 learn the importance of obeying God and the consequences of failing to do so. The musical also teaches that God is always there and that we are to love one another as He loves us. This musical is timeless!! There are such great messages and truths from God's Word from both the drama and the music. The songs are written so creatively the kids had fun learning them! We used this musical for grades 1-5. I would highly recommend it! Go, Go Jonah is a very well written & Biblically sound story with a great missions focus and many fun parts for both boys & girls. Kathie Hill has a great way of writing scripture truths with great humor for all to enjoy! Kathie’s Note: “Go, Go, Jonah” is a classic. The Jonah is a non-speaking part, so any kid can be the “star.” Boys love the song “Terminator, Too”, “Ninevah” is a riot and “Go Ye Therefore” can be used for any missions activity. Songs, script, production notes, piano transcription. (in-stock - limited quantity). Limited stock. Downloadable pdf of all songs, script, production notes & piano transcription (40 F/B pgs) with permission to make 3 copies . Additional copies require purchase of additional 3x license/s. Dovetailor Pages - Go, Go Jonah! Listening CD Bulk Pack - Go, Go Jonah! Spanish Choral Book - !Ve Jonas a Ninive! Libro coral para el musical infantil Go, Go Jonah 80 page print download of all songs, dialogue, stage directions and production help in Spanish.